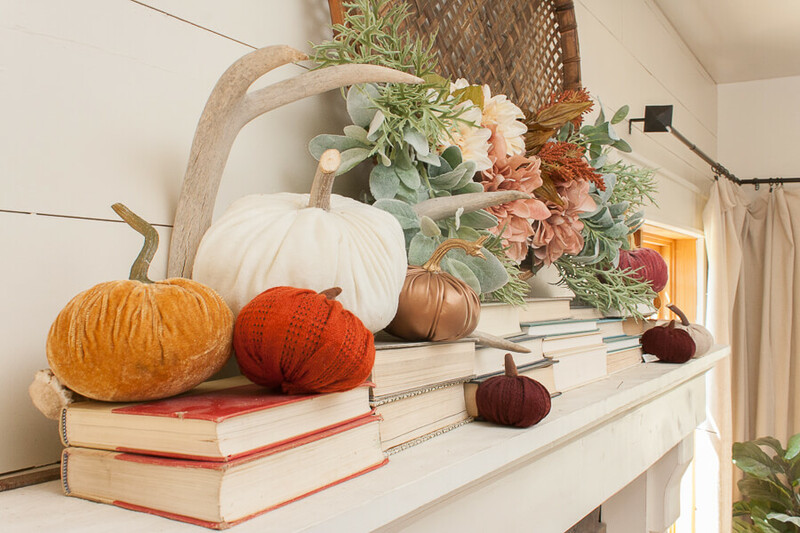 I love a mantel decorated for fall. 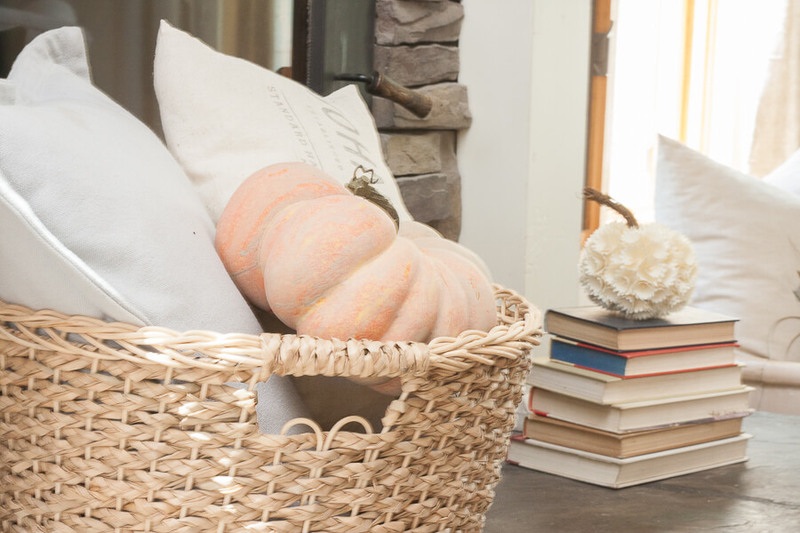 There is nothing better than some pumpkins, earthy colors, and textures. This is what I was after with my fall mantel decor this year. However, I also wanted to include some upcycled items too. I am all about that. 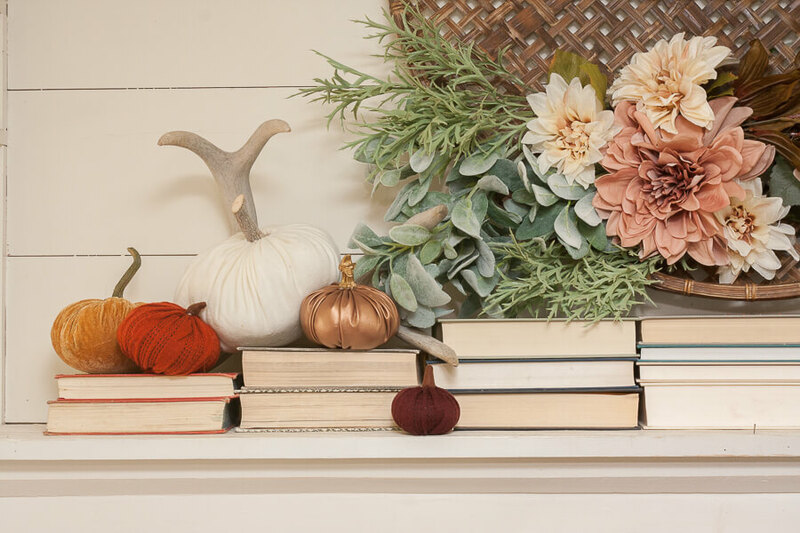 I am so excited to show you my fall mantel decor this year. 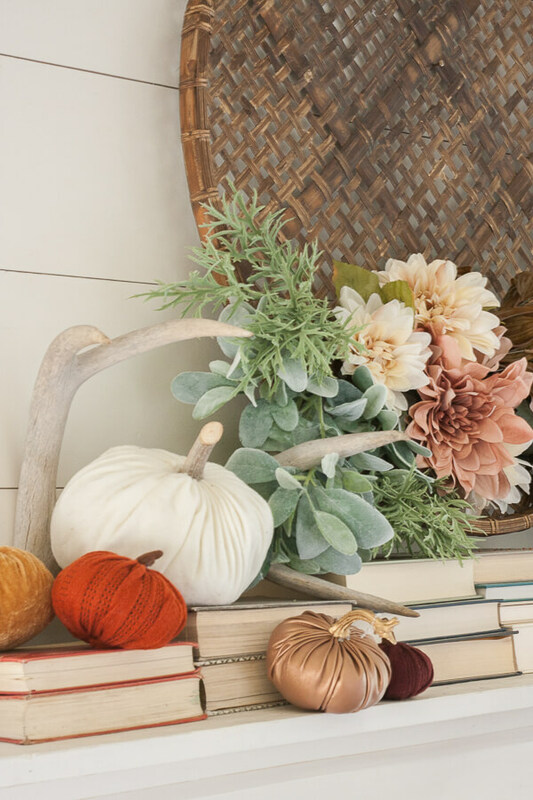 I really wanted to depart from some of my usual fall decor, and add a bit of a feminine touch by incorporating more flowers and soft blush colors. 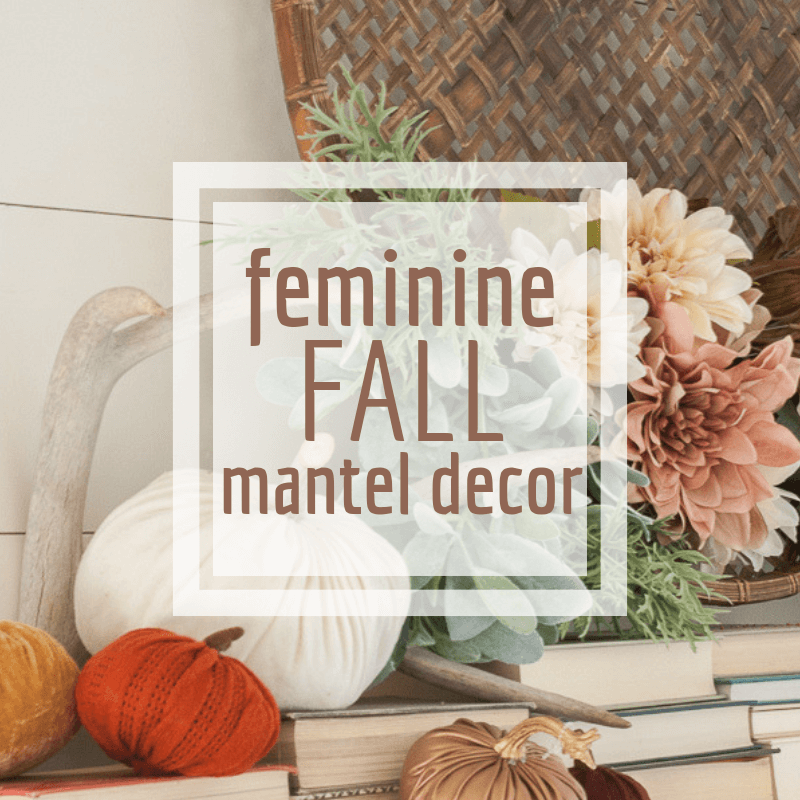 I am also excited to be part of a fall mantel blog hop, so that you can get tons of mantel ideas in one place! Keep on scrolling to see more! Creating unique and custom wreaths for my homes decor is one of my most favorite things to do. This one was on a much larger scale, but I think that it was worth it. Why don’t we have a look at it now that it hangs above my fireplace…. My fall mantel decor turned out better than I could have imagined! Its much more feminine than I have ever done before. I always find my decor to have a bit more of a masculine feel. Maybe its because I live in a home with 4 boys! At least I have one other girl to help me enjoy the girly things in life. And she sure loved all of this. I started my fall mantel with my large fall basket wreath. This was the focal point, so I wanted to make sure that I put it up first and the rest blended seamlessly with it. I then added my books. I love using books on my mantel. They add a fun bit of design and texture! 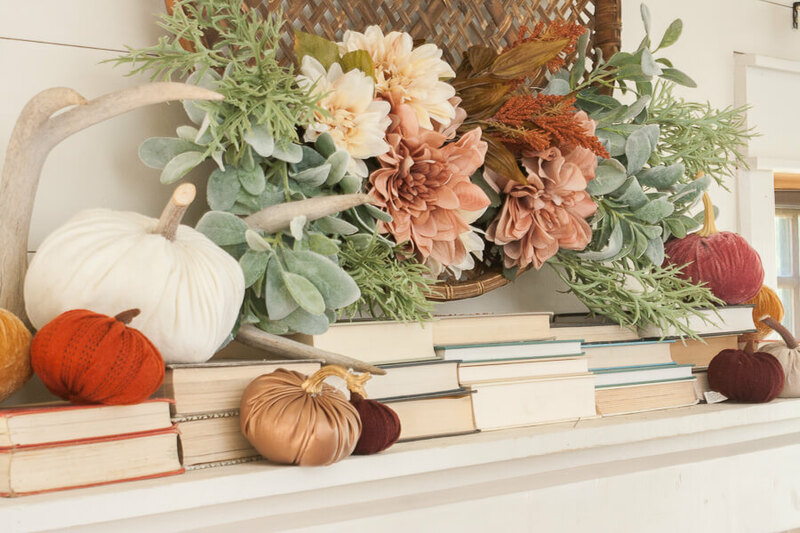 This mantel decor could not be more simple, really. 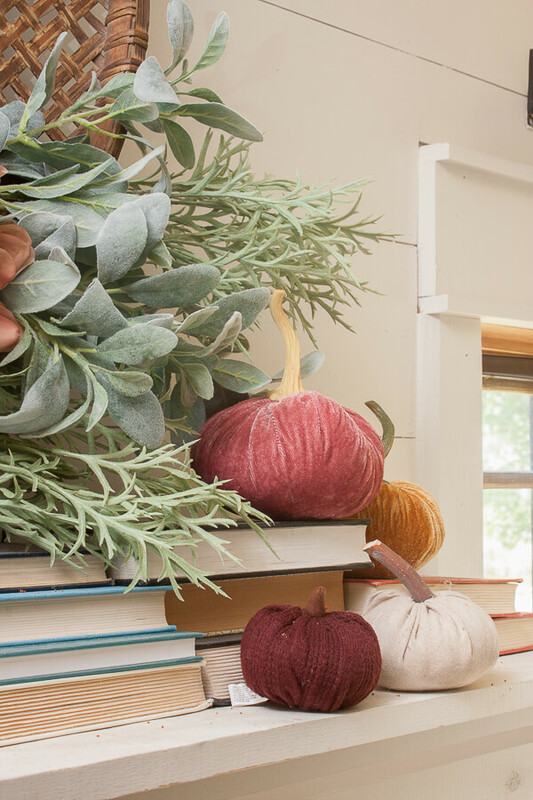 I kept it simple, and there are really only three elements here…books, flowers, and pumpkins. Aren’t these blush flowers beautiful? It really is a drastic take off from my usual fall color pallets. But you see, that is because I asked you to pick the colors for me! On one of my Instagram stories, I asked which color pallets you thought I should use, and you can see that on my porch and entry fall home tour. I chose to use these colors in my living room and in my fireplace mantel decor as well. In addition to the books and the flowers, I wanted to shower the whole space with pumpkins. Pumpkins and pumpkins galore! I wanted to combine various colors and textures with my pumpkins. The assortment of various textures add interest and I love the way they all look together. Nobody ever said you had to use orange and as your main color for fall, and this year, I wanted my decor to take on a less traditional approach. 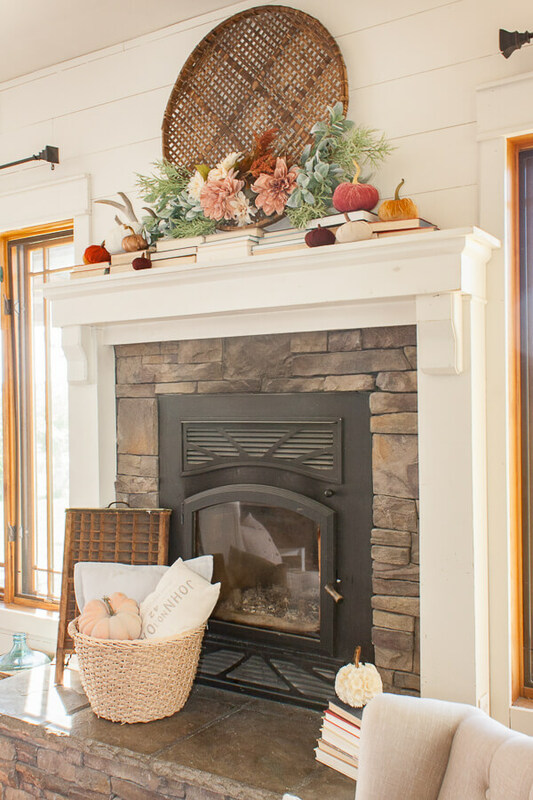 I think that this fall mantel is a beautiful, non traditional style mantel. It has upcycled elements as well as some sweet store bought pumpkins. I have also included some hand made fabric pumpkins. 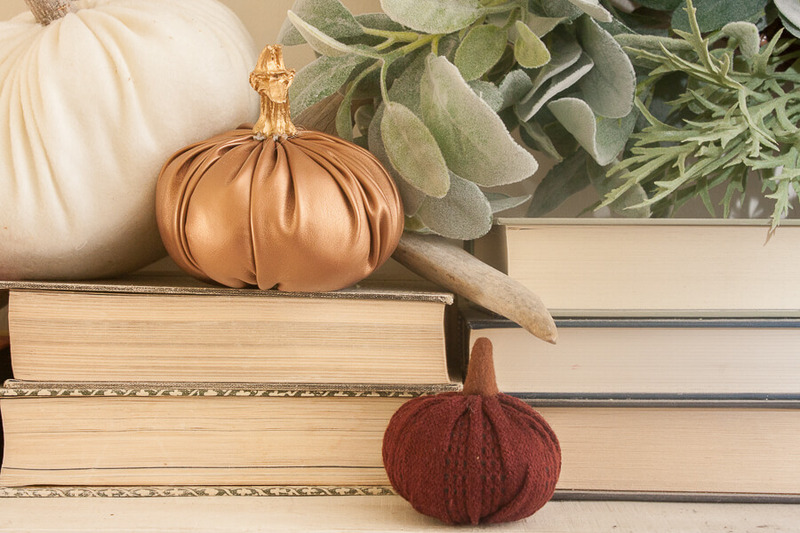 I am very much obsessed with this metallic copper pumpkin… and right now, its ON SALE!!! I think this was the inspiration that I decorated the whole fireplace mantel with. Its so pretty. 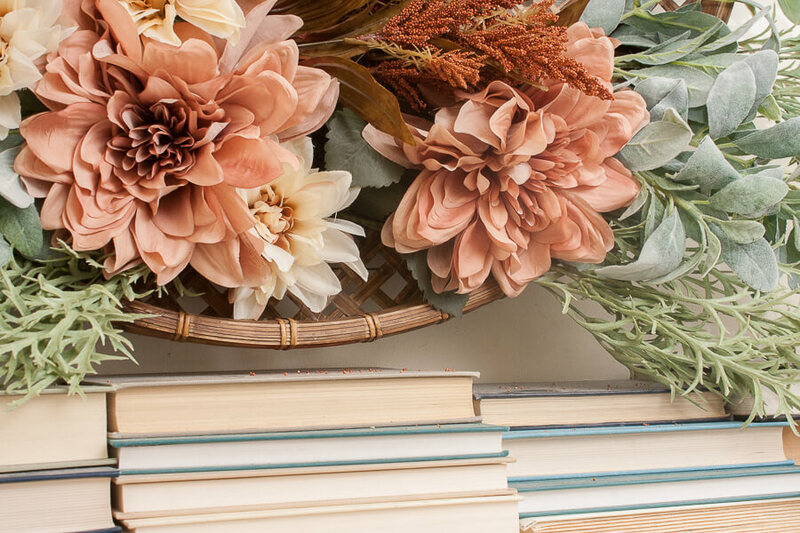 Books, flowers, and pumpkins. How can you go wrong! I planned on this design to be able to transition easily from fall, to Halloween, Thanksgiving, and then possibly until Christmas. I may not redecorate for each and every different holiday, but it will be easy to do if I want. I forgot to mention my lonely piece of deer antler. I wanted to add just a little bit of a rustic touch and this deer antler certainly does it. I love using deer antlers in my decor. 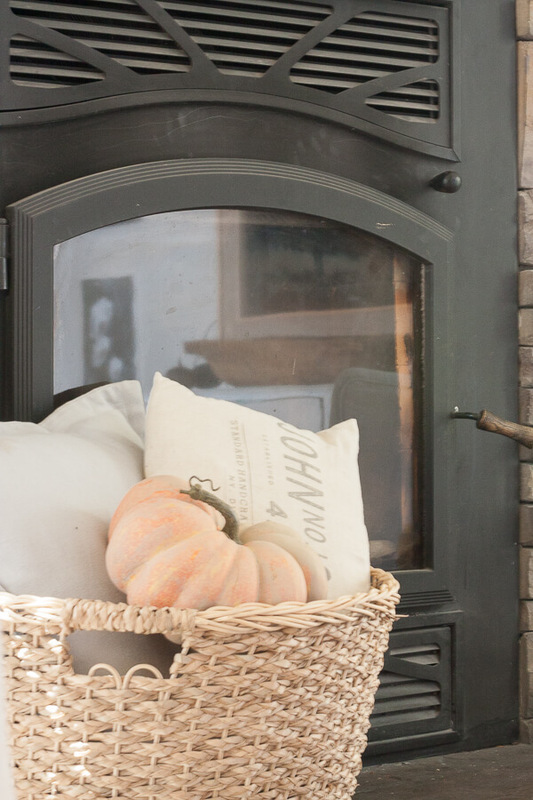 As an added bonus, I added some fun decor items to the hearth of my fall mantel. 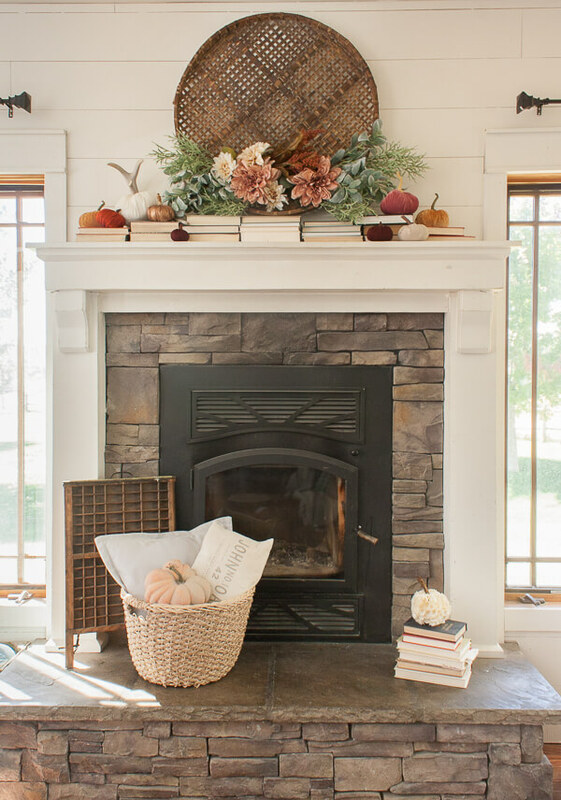 What kind of fall mantel are you thinking of doing this year? 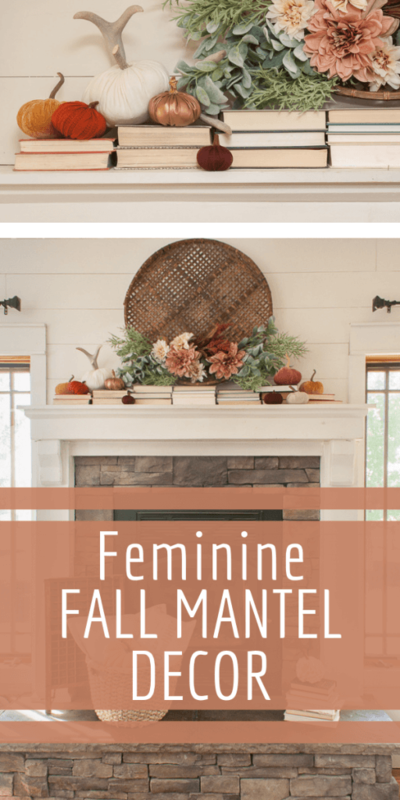 Have you though about creating a feminine fall mantel? I hope this has inspired you to create something fun for yourself! I absolutely love your mantel.. The colors you chose are beautiful! It is the perfect welcome to fall. Thank you for sharing! This is just beautiful. It just feels so romantic! The books and the velvet and the flowers. I just love it all. Really lovely. This is beyond beautiful and magazine worthy! I love your use of books, you’re a woman after my own heart 🙂 I’m going to have to copy this some day for sure! I absolutely love the blush flowers… if I could put blush flowers on everything I would! Sounds like the boys will just have to get on board with this little feminine fall fiesta! Love it! I am in love with your color choices but that basket steals the show! It’s amazing and looks so great with the shiplap! Gorgeous mantel for sure!